The enigmatic Anne Boleyn comes to life in this charming, brilliant portrayal by acclaimed British novelist Margaret Campbell Barnes. The infamous love of King Henry VIII and the mother of Queen Elizabeth I, Anne Boleyn undertook a rocky journey from innocent courtier to powerful Queen of England. A meticulous researcher, Margaret Campbell Barnes immerses readers in this intrigue and in the lush, glittery world of the Tudor Court. The beauty and charms of Anne Boleyn bewitched the most powerful man in the world, King Henry VIII, but her resourcefulness and cleverness were not enough to stop the malice of her enemies. Her swift rise to power quickly became her own undoing. The author brings to light Boleyn's humanity and courage, giving an intimate look at a young woman struggling to find her own way in a world dominated by men and adversaries. Summary: The enigmatic Anne Boleyn comes to life in this charming, brilliant portrayal by acclaimed British novelist Margaret Campbell Barnes. I found this novel to be historically accurate from what I know; I, myself, am far from a master historian. I just had a minor issue with the year of birth this book used for Anne Boleyn: 1503. Historians are thinking it to be 1501 or 1507 (my personal belief is 1507). However, I didn't count this against the book. Brief Gaudy Hour definitely gave Anne a further sense of 'humanity,' which I enjoyed. After all, no matter what people say about her today or even in her time period, she was only a human being. I enjoyed reading the way she was portrayed in a more sympathetic light, as I personally believe she was a good person. My only issue with this novel was that at times the writing style was 'old' and could be boring. Parts and thoughts of characters could sometimes ramble on, which I did not enjoy, and I often would skip a couple redundant sentences here and there. However, minor flaws did not ruin the book for me; I still found it an enjoyable and suspenseful read about the tragic Queen Anne. 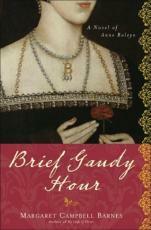 I would recommend this book to any Tudor England novel readers, or perhaps fans of Anne Boleyn like myself. This review was nice :) I've always grown up loving to learn about the Tudors as I'm almost directly descended from them (Elizabeth the first had a cousin, Lady Jane Grey, and the line goes directly from Lady Jane to my mother, whom has the maiden name of Grey. It's pretty awesome :)), and Anne Boleyn has certainly always been my favorite of Henry's wives, pardon the second Catherine. It's very nice to see something on here about them, as I haven't read anything on here that goes back that far in time and is still historically accurate, but of course, this is a review. I think I shall read this book, though, since it seems to have passed inspection.